By John F. McKenna (McJack): “Regular” World Boxing Association (WBA) heavyweight champion Alexander Povetkin (22-0, 15 KO’s) wants to take on WBA/IBF/WBO/IBO heavyweight champion Wladimir Klitschko (56-3, 49 KO’s). The WBA title was declared vacant when Wladimir was elevated to the super WBA title last summer after his victory over David Haye. Povetkin then won the “regular” WBA title when he won a unanimous 12 round decision over Rusian Chagaev in August. Povetkin who is trained by American Teddy Atlas will be taking on 42 year old Cedric Boswell (35-1, 26 KO’s) on December 3 in Helinski. Boswell has put together a string of 14 consecutive victories after taking a three year hiatus from boxing. Cedric suffered his only loss at the hands of Jameel McCline in 2003. When Altas initially started training Povetkin he acknowledged that he began looking for heavyweight prospects from Eastern Europe because he was having trouble finding boxers from the United States who were willing to make the sacrifice and pay the price that was required to become a champion. Atlas is particularly impressed with the work ethic displayed by Povetkin. Povetkin won an Olympic gold medal in 2004 in Athens in the super heavyweight division. Klitschko won his Olympic gold medal at Atlanta in 1996, also at super heavyweight. Wladmir has gone on record to say that he would welcome a “duel” between two Olympic gold medalists. Wladimir and Povetkin had previously been slated to fight in 2010 but Povetkin pulled out of a prefight press conference citing illness. Ultimately the proposed fight between Povetkin and Klitschko was cancelled. 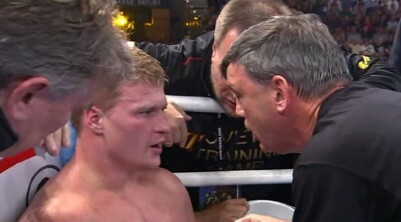 There was some dispute at the time as to why Povetkin pulled out of the fight. Trainer Teddy Atlas later acknowledged that Povetkin would need two or three more fights before he would be ready for a match with Vladimir. Wladimir will match up against French challenger former cruiserweight champion Jean-Marc Mormeck (36-4, 22 KO’s) on December 10 at the ESPRIT Arena in Dusseldorf, Germany. It is no secret that Klitschko is having trouble lining up worthy challengers. Prior to the announcement that Jean-Marc Mormeck would be Wladimir’s next opponent he revealed that Chris Arreola, Robert Hellenius, Alexander Povetkin and Tyson Fury had all declined offers to fight him.